The West Bench Trail is located in the Grand Mesa National Forest about 60 miles east of Grand Junction, Colorado just off of Colorado Highway 65. 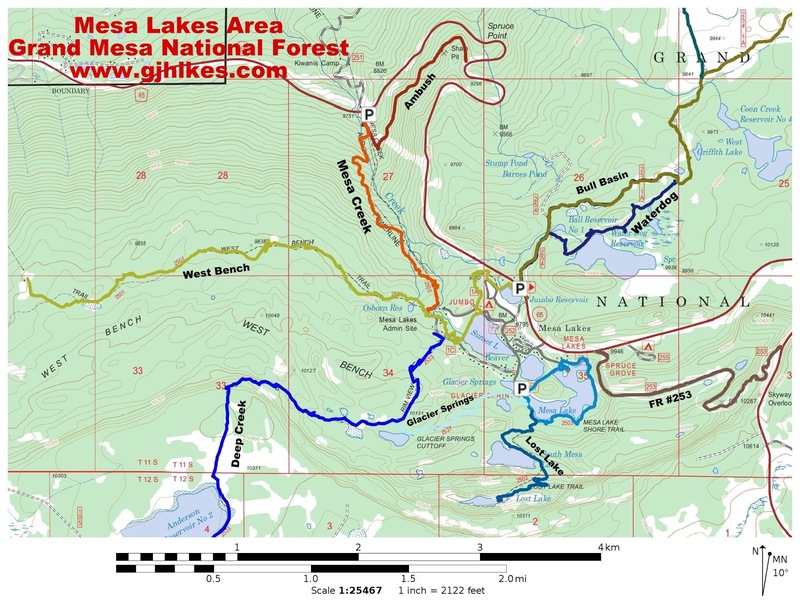 The trail runs along the west side of the Grand Mesa from Jumbo Reservoir to the area above the Powderhorn Ski Resort. The West Bench is a popular trail with cross-county skiers and snowshoers in the winter months and hikers in the summer time. We noticed a set of fresh horseshoes so it must get some use from equestrians. We began from the Jumbo parking area right at noon. There were some mosquitoes around Jumbo Reservoir but we made it through them unscathed and we didn't come upon any afterwards. The temperature was in the upper 60's when we started and around 72 F when we finished. A Forest Service crew was packing in some gravel in wheelbarrows and building up the trail around the Jumbo Campground. We decided to test their work and follow the trail around the campground. It added almost half a mile to the hike compared to hiking through the campground. If you get confused by all of the roads and side trails and aren't sure where you're going then find your way to the Sunset Lake dam. From the dam the trail is well marked with signs, blue poles and blue diamonds, which signify 'Ski Trail', that are nailed to the trees. By the time we got to this sign we had already hiked about 3/4 of a mile. We were hoping the trail was going to be in good enough shape to make it all the way to the Powederhorn Lift #1. The West Bench Trail is a pretty easy hike when all the snow is melted off and there isn't a lot of water running across the trail. I guess we gave it a 'Moderate' rating because of the length of the hike more than anything. There are a few gradual hills along the way but nothing too bad. The altitude might be a bigger obstacle than the change in elevation. 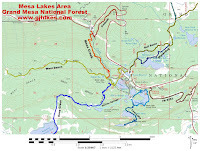 The trail climbs about 250 feet over a 3 mile stretch with one particular hill that rises about 60 feet. Even though it didn't seem like much climbing while hiking in it made for a pretty sweet hike on the way out. We hiked in to the first lift and of course we had to walk over and check it out. There were a couple of people sitting inside holding the fort down. They seemed to be oblivious to our presence. Since it is still about a week early for alpine hiking on the mesa we had a few obstacles to contend with. We made it past this water hazard by crossing on a fallen tree a little ways down stream. There were 3 or 4 snow banks that we had to cross but they were pretty solid so we were able to walk right across them. They will probably be gone in a few more days. The trail was solid and any mud was just a skim on the surface. Nothing that we would sink into. All the lakes that we saw were full and spilling over. The waterfalls were still bringing a lot of melted snow down from the top of the mesa. The meadows were quickly filling with wildflowers. The lower sections of the mountain had an abundance of Dwarf Lupine, yellow Arnica and even some sweet pea vines with their little white flowers. The raspberries were beginning to bloom and the choke cherries were already in full blossom. Our extremely pleasant hike came to an end back at Jumbo Reservoir. We had definitely picked a good day to come up to the Grand Mesa. The temperatures up here were about 20 degrees cooler than down in the valley yet it seemed plenty warm in shorts and short sleeved shirts. It was cool enough and the trail was easy enough that I only went through about 60 ounces of water. If you like alpine hiking through pine, spruce and aspen trees and crossing meadows of grass and wildflowers then the West Bench Trail is a great place to visit. If you would like to see it for yourself then all you have to do is 'Take a hike'.